INDIANAPOLIS, July 14, 2018 – Colin Van Wicklen of Magnolia, Texas/Cypress Academy of Gymnastics, posted the top senior all-around score at the 2018 Men’s National Qualifier at the U.S. Olympic Training Center in Colorado Springs, Colo. The qualifier wraps up on July 15 with the junior technical sequence at 11 a.m. The event is the last opportunity for men to qualify for the 2018 U.S. Gymnastics Championships in Boston, Mass., Aug. 16-19, as well as an opportunity to tune-up for nationals. Eighteen men qualified for the senior competition at the U.S. Championships, and the qualifiers are listed below. Van Wicklen’s 83.650 was the highest senior all-around score. Cameron Bock of Tustin, Calif./University of Michigan, had the second best all-around total at 82.250. Genki Suzuki of North Wales, Pa./University of Oklahoma, rounded out the top three senior all-around scores with an 82.050. 2016 Olympian Sam Mikulak of Newport Coast, Calif./U.S. Olympic Training Center, who did not compete in all six events, earned the highest scores for three events: floor exercise, 14.600; still rings, 14.800; and horizontal bar, 14.700. The highest score for the remaining events were: pommel horse, Donothan Bailey of Mission Viejo, Calif./U.S. 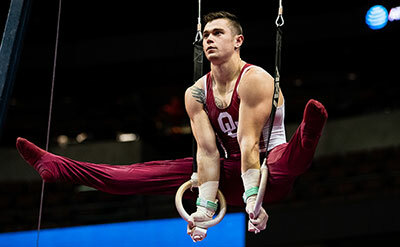 Olympic Training Center, 14.450; vault, Van Wicklen, 14.700; and parallel bars – Bock, 14.550. Going into the final day of the junior competition, Khoi Young of Bowie, Md./Sportsplex Gymnastics, tops the junior division in the all-around rankings (76.700), followed by Jordan Williams of Concord, Calif./Head Over Heels (76.250), and Adam Wooten of Nashville, Tenn./Harpeth School of Gymnastics (75.55). The junior competition will be completed after the Technical Sequence competition. Athletes qualified to the senior division at the 2018 U.S. Championships in a variety of ways. U.S. Senior National Team members named to the team following the 2018 Winter Cup Challenge automatically qualified to the championships. A minimum of 18 athletes qualified to the U.S. Championships based on the national Points Ranking System from the National Qualifier. The top six ranked all-around gymnasts who are U.S. citizens from among the top 12 all-around athletes, excluding any previous qualified athletes, as well as athletes who win the individual apparatus titles at the 2018 NCAA Championships also qualified to the U.S. Championships. There may also be some approved petitions to championships. The total will be approximately 36 qualifiers. Juniors qualify in a similar fashion. The top 22 athletes from the 15-16 junior elite age division from the all-around finals at the 2018 Junior Olympic National Championships and the top 14 athletes from the 17-18 junior elite age division from the all-around finals at the 2018 Junior Olympic National Championships qualified to the 2018 U.S. Gymnastics Championships. The top six age eligible juniors from the junior elite division at the 2018 National Qualifier qualified using the rank order all-around results (optional + technical sequence score) with 15-16 and 17-18 age divisions combined also qualify. This totaled approximately 42 athletes in two age divisions. Athletes who have qualified for the Senior Division at the 2018 U.S. Championships are listed in bold. *Denotes pre-qualified athlete to the U.S. Championships. Only athletes who received points are listed in the points results.